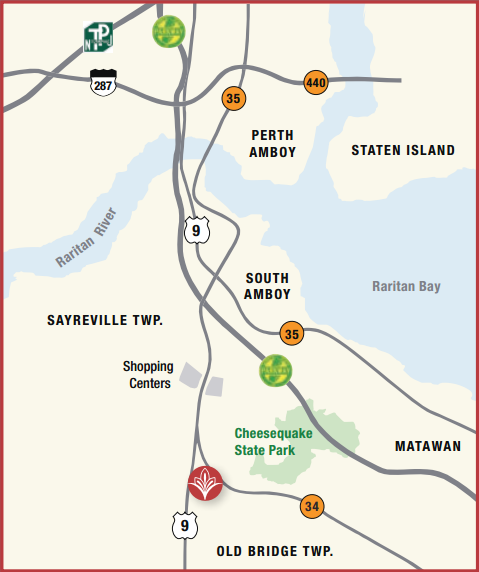 The development is within minutes of Cheesequake State Park as well as, golfing, and boating, the Jersey Shore is only 23 miles away. Residents are never left searching for entertainment. Three gyms, located less than 6 miles away, tenants have plenty of ways to stay active. Spend the day relaxing in our interior courtyards or check out The Shoppes at Old Bridge just a 5 minute ride down Route 9. The Woodbridge Center Mall, The Freehold Raceway Mall, and the Bridgewater Mall are also just a short trip away. Commuters and city-goers need not look any further. Madison Gardens is only a 45 minute ride from New York City. NYC buses are a short walk away, and nonstop Park and Ride service is minutes away. Major highways including Route 9, the New Jersey Turnpike and the Garden State Parkway are within easy reach of Madison Gardens, making travel to any destination convenient. Our outstanding amenities, convenience, and central location cannot be beat. Madison Gardens has it all at an affordable price!